I’ve been reading as much about meniscus tears as possible and the news does not look good. It seems that most medial tears require surgery. There is no blood supply on the medial side of the joint and therefore no way to bring healing nutrients to the injury. This explains why the size of the swelling in my knee hasn’t been tremendous. A Facebook friend who had a similar injury told me the excruciating pain is probably fluid leaking into the joint, which is why I could find nothing to alleviate the pain. He gave me a link to the doctor that repaired his knee and when I asked how he repaired it, he answered surgery. Great… Surgery means a recovery time of several months. My desire is to stay away from this option and heal it with love instead! However, I guess I will have to find out the size and complexity of the tear from an MRI first. (From the pain I have been experiencing, I would guess it is now a large, complex tear). My yoga teacher, David, offered a ball rolling self massage class as a treat before the holidays on Tuesday. I was very excited about this news as it has been the longest time since I have done any of this kind of work and my body has been greatly in need of it. He used to incorporate some of this work in his classes, but I can’t even remember when the last time I did this was! And at this point, it is the only class I can attempt. One of the co-owners had just finished teaching his class when I arrived. When I passed him in the hallway, I told him that I had torn my meniscus. “That happened to me, too!” he said. I was stunned. I knew he had torn his hamstring years ago, but never heard about him injuring his knee. “I had the surgery and half of my meniscus is now completely gone!” he happily said. (I can’t imagine this being a good thing!). I told him that the orthopedist I saw said there was nothing I could do. He shook his head and told me to tell him I need to see a sports doctor. “I couldn’t straighten my leg.” “Neither can I!”. Apparently, the injured tissue keeps getting caught, creating pain, as well as causing the leg to give way. I brought my mat into the yoga room, where my teacher was setting up a special light display for us. “I tore my meniscus!” I told him. “I heard!”, he said. It doesn’t surprise me that Todd immediately went for the surgery, whereas David advocates physical therapy. They are opposites in a lot of ways. Todd is very logical, scientific, and non-emotional. I have a friend, who also possesses many of the same traits as Todd, who keeps imploring me to see a doctor, go to physical therapy, heal myself by following the “standard practices”, which I have a high degree of resistance to based on my previous experiences. Surgery is not even a question for him. David, on the other hand, is highly emotional and although he and I both see merits in some of what science has shown, we tend to rely on a deeper and more holistic wisdom. He is trained in myofascial release and does bodywork, as well as teach yoga. And although he was highly against chiropractors a couple of years ago when I was seeking one out, he has since been seeing one since he injured his back this past summer. Whereas Todd is against the display of emotion, David often says that it is not a good day until he makes someone cry (to release something that is hurting them). (I am clearly more on the same side that David is!). I was very happy to be in that room with him on Tuesday, witnessing the depth of love that he has for what he teaches, the extra effort that he puts into making the room cozy and decorative, and the thought that he puts into the music that he plays for each class. There is no question that he excels at what he does and it is so nice to see someone using his gifts to his fullest capacity. I’m not sure how much the class actually helped me due to my level of pain, but it was good to be reminded of some of the techniques and positions, and it was definitely good to laugh again. On Friday, I finally received some fascial bodywork that I had long been desiring. I went to see the woman who performed the series of 10 rolfing sessions on me way back in 2007! The last time I had seen her was April of 2011. I had written to her about my meniscus tear to find out her opinion, and just as I thought, she said she could help provide some space for my knee (although she recommended that I ice it, elevate it, and compress it, as well as seriously consider the surgery). (The medial meniscus is highly important for stabilizing). It was great to be on the table, having someone work on my body. Daphne is very feminine and always shares her latest man stories with me, which is always humorous, light, and hopeful, and we also talk about transformational life stuff during our sessions. Her work has gotten much lighter with more experience, which was perfect for me. My initial series was quite painful and back then, I equated pain with lasting change. Now, I believe that lighter work is just as beneficial when it comes from a skilled practitioner. Just as in the article that I had read in the New York Times, she avoided touching my knee and instead worked on my feet and hips, and then did a bit of opening on my inner thighs. I have not been able to stretch my left hip at all for the past 7 weeks because I can’t externally rotate my left knee without extreme pain, and my right hip has gotten extremely strained from trying to bear the weight of both legs when I attempt to walk. She asked me to breathe into my hip, and my first breath made the tissue more pliable and easier for her to manipulate. (This breathing thing we are taught to do in yoga really does do something!) She then opened up some of my pec tissue, my throat, and finally my back muscles (which she was very impressed with!). It was clear to her that the yoga I’ve done has paid off. My posture is better and my body is visibly physically strong (even after 7 weeks of barely moving!). And perhaps even more importantly, she was impressed with my attitude and mental strength. After the last couple of years I’ve had (and really this lifetime that I’ve had), I just couldn’t believe this latest injury, leaving me unable to even walk! How could this possibly be happening to me?! I have come to learn, however, that feeling bad about my circumstances is not helpful. It is merely a fact of what is happening. And the only thing I can do is choose how I will respond to it. So, I have been trying to keep my spirits lifted as much as possible and gather healing energy for the best possible outcome. Daphne said that when things like this happen, it is an opportunity to gain a greater body awareness. There is no question that my body awareness has exponentially grown in the past few years. And there is also a lot of evidence that my mental strength has grown a great deal, as well. I told her that this year has been both physically and financial extremely difficult (probably my worst ever! ), but that spiritually, it has been one of my strongest. She was not at all surprised by that correlation. She said the spiritual strength is something that will remain with me throughout my lifetime. When I got off the table, I felt so much lighter and felt like I could almost walk again! And unlike my visit to the doctor, I got a big parting hug! I love my holistic healers! 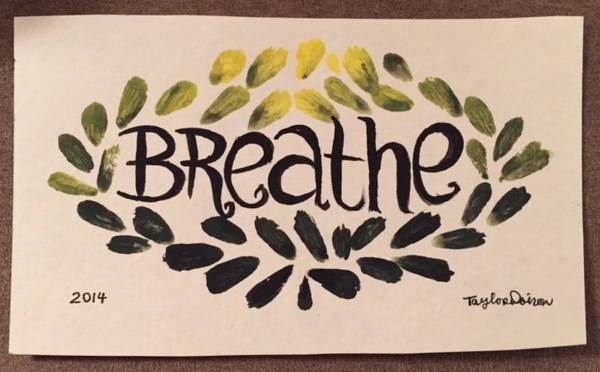 And thanks to my friend Taylor, who painted me this beautiful card, I now have a reminder to breathe!